With it being Easter weekend, it got me thinking… does everyone around the world celebrate the way we do here in the U.S.? My global studies minor had me wondering. I wanted to know if there were different traditions around the world other than the classic ‘Easter Egg Hunt’ that we are accustom to. After some research, I found quite a few fascinating traditions. Bermudians celebrate Good Friday by flying home-made kites. Traditional kites are made with wood, metal, string, colorful tissue paper and long tails. They can be so large they require multiple men to get them in the air, or they can be simple and light enough for a child. The Bermudian kites are known for their creativity. Not only are Bermudians known for flying kites, but on this special day they indulge in codfish cakes and hot cross buns. Easter is celebrated with colorful parades and a traditional ‘rara’ orchestra. This orchestra consists of bamboo trumpets, goatskin drums, maracas and a chorus of singers. The parade performances will begin on Ash Wednesday and continue through Easter Weekend. This holiday is a mix of Catholic and Voodoo traditions. Voodoo believers will hold goat heads and other parts of animals as offerings to the spirits. This will also be displayed through chanting, drumming, and animal sacrifices. Is it Halloween or Easter? In a Finland tradition, children dress up as brightly colored witches, wearing scarfs with painted faces and broomsticks in hand. The children will come knocking on your door, and offer to bless your home, in exchange for candy or treats. The witches go out on Easter Saturday in western Finland, but on Sunday in other regions on the country. On Easter Monday, there is a tradition of young men splashing unmarried girls with holy water. This began as something playful and was meant to spark romance. Legend says girls who get soaked will marry within the year. The girls get the guys back by soaking them on Tuesday. Today, it has evolved into a full on water fight. People will use buckets of water, water guns, or anything to soak one another. I hope you’re hungry on Easter Monday in Haux, France. 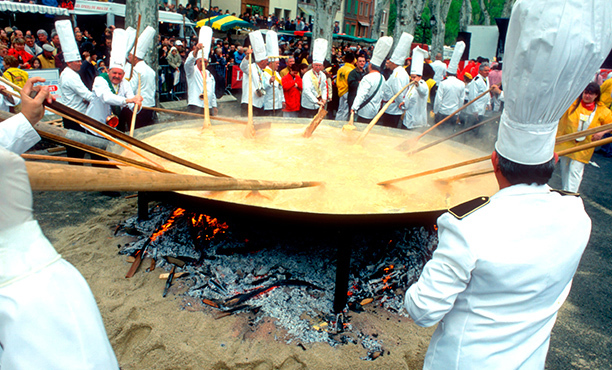 Each year, the town makes a giant omelet used to feed up to 1,000 people and is served in the town’s main square. A story goes, Napoleon was passing through and stopped at the small town an ordered an omelet. He enjoyed his food so much that he ordered the townspeople to gather all their eggs, and demanded a giant omelet be made the next day to feed his army. The omelet gets to be nearly 10 feet in diameter with over 5,000 eggs, 21 quarts of oil, and 110 pounds of bacon, onion, and garlic used. If you want to experience a loud tradition, you’ll definitely find it on the island of Corfu in Greece. 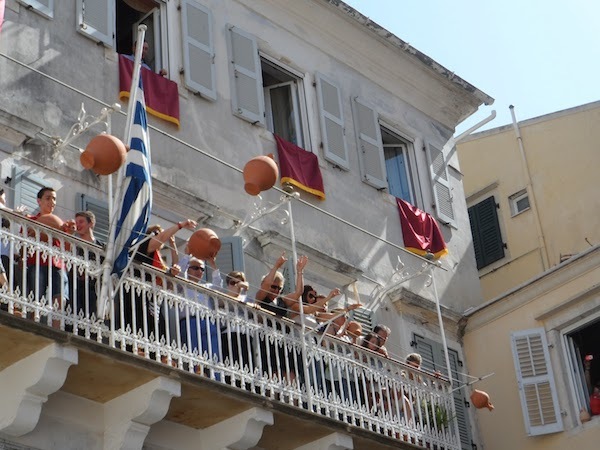 On the morning of Holy Saturday, the traditional ‘pot throwing’ takes place. Everyone gathers to throw pots off balconies so they will smash on the street below. Some believe this tradition is meant to welcome spring, symbolizing new crops that will be gathered. I hope you enjoyed these unique traditions as much as I did. I love being informed about not only my culture, but culture’s all around the world. Are you going to be on Campus for Easter this year? Purdue Christian Campus House is holding a service on Easter Sunday at 9:30am and 5pm. You may not be dressing as a witch, smashing pots or taking part in a water fight, but you can still find a way to celebrate and worship if you’re at Purdue. + If you want to read about more traditions, I found my information here, here, and here.